With a big reduction in the number of new tankers produced last year, manufacturers and ancillary equipment suppliers are increasingly turning to niche markets. 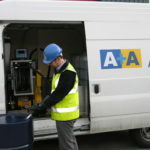 One niche area which has attracted the attention of Alpeco is bespoke liquid loading and dispensing systems for depots, harbours and trucks, with the company focusing its efforts on the design and manufacture of such equipment. A unit with a small demountable electric pump and meter system is now available from Alpeco. Designed to be carried in a van or pick-up truck with an IBC or small storage tank, the unit is ideal for conducting small fuel deliveries to plant equipment such as generators, or for sites with difficult access where it may not be practical or cost efficient to send a delivery tanker. see the 2013 Tanker Review in the February issue of Fuel Oil News.